These are fantastic! They wash up so and go right into the dryer. The quality is great and feel so soft after every wash.
Pamper yourself with 1000-thread count cotton sheets.These luxurious sheets are made from cotton primarily grown in theNile Valley. This single-tone striped set features a flat sheet, afitted sheet and two pillowcases. It is available in a number ofattractive color options, so you can choose the perfect one to setoff your bedroom accessories. Slip into luxury at the end of a longday with these comfortable, silky-soft sheets for a tranquilnight's sleep. Only draw back is I have a 12 inch mattress and these pop off quite a bit... I would definitely not recommend if you have a 12 inch thick mattress (and don't even bother if you are above 12). These are probably perfect for 10 inches and below. But they are perfectly soft and don't wrinkle too much as long as they come straight out of the dryer. Great quality especially for the price. I have hunted and hunted for sheets like a bought from Overstock years ago and could never find anything I liked. What a surprise to find these even better than what I though was the best. I like a substantial, almost heavy sheet and these meet that criteria. Although probably heavier than most they are surprisingly soft and smooth with almost a sateen finish. These might not be as silky smooth as thinner sheets some people prefer. I went to Consumers Report and their top choice was Royal Velvet from JC Penny where over 3000 people had said the sheets were fantastic. So I ordered some and was very, very disappointed. The Royal Velvet sheets from Pennys were thin and just average IMO. However, these Luxor Threasures sheet are genuinely fabulous for my criteria of substantial while still being satiny smooth. Some people might think they are too substantial. The stripes of this design are shiny. These are elegant, high quality sheets. I can not say if these are 1000 thread count or not but when the package came I though it must be something else in the container because the package was so heavy. So they put a ton of cotton into these sheets which is almost more important to me than thread count. There is so much deception in thread counts today as to be meaningless. I ordered the Blue color and it was lovely. Not a pale, washed out blue or a grey blue. More like a Wedgwood Blue - rich with very good color saturation. Not bright however. I washed before putting on the bed and they seemed to wash and dry just fine without a ton of wrinkles like thinner Egyptian cotton sheets might. My mattress is only 78 x 75 (latex slab) so the fitted sheet is a bit loose. The elastic around the entire sheets helps to fit better. I plan to buy another set - possible even two more! If you like substantial weigh sheets while still being soft and smooth I think these are it. The sheets came to today. I had great expectations; they were to replace Italian sheets that have been wonderful, but starting to show wear.. I washed and dryed as per instructions. The top sheet has loose threads, and does not fold evenly. The pillowcases are narrow and on one the seams are off so that more fabric on one side makes it sloppy and uncomfortable on the pillow. Make sure you note the item number for these sheets made by Luxor. Great sheets even after only one washing. I can only imagine they will get even better with time. I ordered the exact same color in the 400 thread by the same company. The stripe and detailed hem is truly stunning. This buy will give you many nights of comfortable slumber. I think the weight will be tolerable for all seasons. The deep pocket fitted sheet was perfect for my pillow-top mattress. The extra 2 inches on the length and width of the flat sheet gave me the drape I was seeking. Great Job on this product OverStock. I will be looking for when these go on sale ! With washings, these sheets are amazing! I bought these sheets hoping for durable, soft-not satin soft, but not crisp. These are perfect after about 6 washings. They are very heavy sheets. I usually sleep with just them and a light blanket and it is perfect. I don't feel like they are going to tear when I put the fitted sheet on the corner-durable. I bought the sage and the color is true. If you give them a try, I don't think you will be disappointed. These get better with every wash. Love the deep pockets. Very soft and luxurious feeling. I have a temperpedic mattress with a 4 inch topper and they fit great. Will buy again. WE HAVE PURCHASED 2 SETS OF THESE SHEETS AND PLAN TO ORDER ANOTHER SHEET SET LIKE THEM !! WE ARE IN OUR 70'S AND THESE ARE THE MOST COMFORTABLE SHEETS WE HAVE EVER PURCHASED. GREAT QUALITY..SOFT AND VERY COMFORTABLE TO SLEEP ON.. WE SLEEP ON THEM EVERY NIGHT ...COLORS ARE TRUE AND LONG LASTING EVEN AFTER BEING WASHED WEEKLY.. THANKS TO OVERSTOCK WE CAN HAVE QUALITY BEDDING AT A MUCH REDUCED PRICE . Customer Reviews 4.3 out of 5 stars 1,767 4.3 out of 5 stars 5 star 67% 4 star 18% 3 star 4% 2 star 3% 1 star 8% Share your thoughts with other customers Write a customer review See all 1,767 customer reviews Read reviews that mention sheets bed mattress washed wash king sleep pillow deep fitted thick softer cases smooth luxurious washing thin slept sets value Top customer reviews Linda Pardue 5.0 out of 5 starsSoft doesn't begin to cover it. September 27, 2017 Size: Queen|Color: White|Verified Purchase I am NOT the type to rave about a product. That being said, I would rave about these sheets any day of the week! I read the previous reviews so i was a little reluctant to buy them - even at the Daily Deal price, they were more than I like to pay for sheets. But we took a chance on the Queen set in silver. When they came in, the first thing I noticed was the quality of their packaging. Opening them, the pillowcases were measured: as promised, 20 by 30 inches. No hanging thread, no bad smell, just nice, smooth, thick cotton in a sateen weave. Washing instructions were machine wash cold, dryer low - appropriate for 100 percent cotton. The fitted sheet was indeed fully elasticized and neither it nor the flat sheet had any hanging threads. Then, the real test; sleeping on them. I am in love. the sheets I purchased are of the highest quality. I consider myself a sheet snob and these definitely fit my criteria for a comfortable thick sheet. I would recommend them to anyone that enjoy sleeping in the comfort of ahigh thread count sheet. very nice looking. they fit around the corner of the mattress with plenty to spare, and they don't shrink after each wash. they definitely need to be washed a couple of times before using if you're hoping for smooth and soft. i bought these sheets for a queen bed, the moved and bought a king bed; i ordered the same sheets again X2. After I laundered the sheets, and started to make up my bed, I found that the fitted sheet was much too tight.. I also found a hole along the side of the fitted sheet/. I am very disappointed; especially, since I understand the sheets cannot be returned because they were opened. These sheets are not what I expected. They were much softer before I washed them. I slept on them last night for the first time and they felt really rough and coarse. I have other Egyptian Cotton sheets that are 600 thread count that are much softer on the skin. I hope that they improve over time after they have been washed several times but I am not confident that will work. I think that there are better options available for the price. I ordered these to replace the set that I have had for nearly 10yrs now. My old set, I washed every single week, and they always came out of the dryer looking brand new! After the first wash this set is so wrinkled and rough to the skin, I truly hate that I spent that much money on this set. And I'm quite sure that I can't return them now. Don't buy these sheets as they are no better than 250TC sheets! Simple horrible sheets and poor quality! Have purchased 300 & 600 thread count sheets previously. Don't waste your money....buy these 1000 thread count sheets. You have NOT slept in better sheets than these. Wash up great, deep pockets so no rising up, and feel nice on the skin. I will never buy anything but 1000 thread count again and the price is unbelievable. I promise! I have purchased these particular style, thread count, brand from Overstock over the years. I will not get them anywhere else now. They have the best price, available and quality. I bought these sheets about 6 months ago. I wanted to see how they held up before writing a review. They are AWESOME! I bought 2 sheets at the same time and swap them out every week. The more they are washed the softer they get, without wear and tear, I expect these sheet will last a long time. The pockets are deep, the sheets are soft and warm. In the beginning the sheets were heavy and stiff but the more I washed them the softer they got. I would recommend these to everyone! I did not know what high quality bedding is (and I am a picky one) until I bought this set. As another reviewer mentioned, this is dense, yet incredibly smooth. I've been using it for a few months now - love it. Love these sheets so much that they are the only sheets I want on my bed. I wash them and put them right back on the bed. I have several other sheet sets but prefer these. They are soft and heavy but not too heavy to sleep on/in in the deep south on hot and humid nights. These are the most comfortable sheets I’ve ever slept on. Very good fit and quality and affordably priced. I would most definitely recommend to anyone. These sheets are soft and feel quite nice to sleep in. The color is rich looking, the feel is luxurious. I am very glad I got them and would highly recommend these sheets to others. Total comfort. Such a smooth, sleek finish. Thick, heavy and soft, wonderful sheets. Ordering another set. These are the most amazing sheets I’ve ever slept on - they are just heavy enough to please my senses and very soft! I’m so glad this came up to review so I can forward them to my friends. "Will the bottom fitted sheet easily fit a 16" deep mattress without "popping off" without having to stretch the heck out of it?" "Are these sheets single ply"
The Superior Egyptian Cotton 1000 Thread Count Stripe Deep Pocket Sheet Sets are single-ply construction. "Are the sheets “cool” ?" These sheets are not Percale. 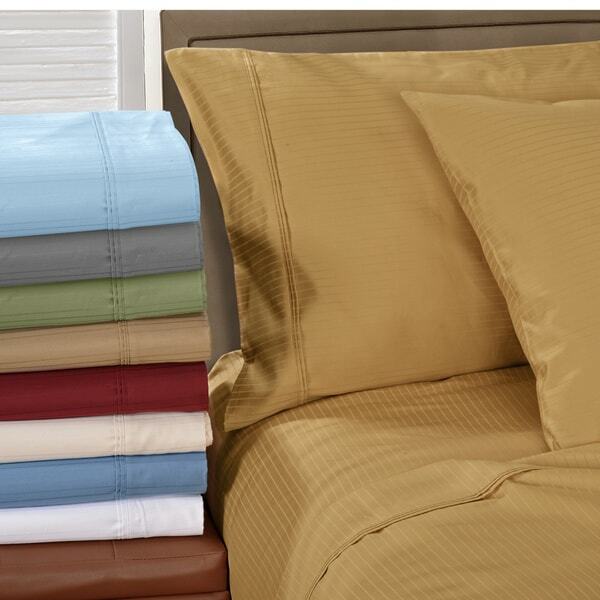 These sheet sets are 100% Egyptian Cotton and feature a sateen weave. "Will they really fit a mattress up to 18" in depth?" yes with room to spare. The seam on these sheets are 12"! There is NO WAY this fits an 18" mattress. I just received them, washed them, went to put them on, they DO NOT FIT a deep mattress, PERIOD. Dont fall for this! Maybe back in 2017 they did, put they do NOT fit now. I Have no choice but to return them. Otherwise, they seem good quality, VERY heavy which folks need to be aware of. "Can I get extra pillowcases in this fabric?" I ordered two sets of standard pillowcases after I received my sheet set with the King pillowcases. "Are these truly the same as the Superior 1500 thread count sheets that you are out of stock of? If they are, then why is the picture of the product not the same ? I don't trust that they're the same. Are they?" The Superior Egyptian Cotton 1000 Thread Count Stripe Deep Pocket Sheet Set differs from the Superior Egyptian Cotton 1500 Thread Count Solid Deep Pocket Sheet Set. While they are constructed both of Egyptian Cotton, the Superior Egyptian Cotton 1000 Thread Count Stripe Deep Pocket Sheet Set is 1000 thread count and features pin stripes while the Superior Egyptian Cotton 1500 Thread Count Solid Deep Pocket Sheet Set is 1500 thread count and are solid in color. 5 Easy Ways to Reuse Flat Sheets from Overstock.com. Our guides provide customers with information about 5 easy ways to reuse flat sheets. How to Put Sheets on a Bed from Overstock.com. Our guides provide customers with information about how to put sheets on a bed. How to Care for Silk Sheets from Overstock.com. Our guides provide customers with information about how to care for silk sheets. How to Fold a Fitted Sheet from Overstock.com. Our guides provide customers with information about how to fold a fitted sheet. Best Reasons to Use Flannel Sheets in the Winter from Overstock.com. Our guides provide customers with information about the best reasons to use flannel sheets in the winter. FAQs about Flannelette Sheets from Overstock.com. Our guides provide customers with answers to frequently asked questions about flannelette sheets. FAQs about California King Sheets from Overstock.com. Our guides provide customers with answers to frequently asked questions about California king sheets. FAQs about Flannel Sheets from Overstock.com. Our guides provide customers with answers to frequently asked questions about flannel sheets. Tips on Changing Sheets from Overstock.com. Our guides provide customers with tips on changing sheets.